Limestone cliffs tower toward the sky, idyllic islands, villages, forests and emerald water that dazzle the worst of critics still don’t define the beauty of Phang-Nga Bay, located in the province of Krabi Thailand. If you are booking resorts in Phi Phi, Krabi and or Phuket, all areas from which Phang Nga can be reached, make sure you book a boat trip excursion to this beautiful location. Snorkeling, swimming and canoeing between caves and cliffs is only part of the fun while on this excursion. Visiting the islands in the bay of which most are uninhabited is another. These include the iconic Phi Phi Island, James Bond Island, Koh Panyi which is inhabited by a small community selling hand craft to visitors, Koh Racha featuring the Racha Resort, Koh Yao which is pristine and idyllic featuring romantic resorts such as Santhiya and several other islets with no inhabitants. Apart from being able to take day and night boat cruises around the bay, kayaking through caves systems of which the roofs have collapsed over time is an absolutely awesome experience. The monkeys and birds and other fauna and flora makes you wonder why you took so long to visit this Eden. Several tour operators will welcome the opportunity to take you on guided tours of the bay and the opportunity to kayak in an unbelievable environment. 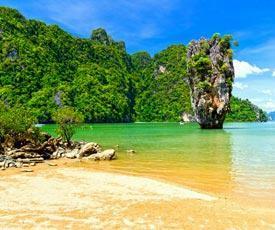 If you are going to stay in Phuket, Krabi, or Phi Phi, make sure you book a tour around Phang-Nga Bay. You can do this in advance or with any of the operators found in Phuket or Krabi. The James Bond movie, Man with the golden gun was partly filmed here which in large part lead to it featuring on the must-see list of attractions in Phang Nga Bay. It's real name is actually Nail Island and when one looks at the image it is quite befitting. More a rock than an island the vertical lime stone boulder becomes more narrow towards its lower end until it disappears in the emerald water of the small bay in which it stands, meters from an eye searing white beach. 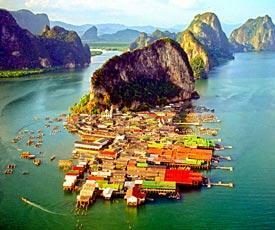 Koh Panyi is another well known tourist destination in the bay. Not really and island it is rather fisherman village build entirely on wooden stilts out over the water against the backdrop of a sheer rock boulder. During the day it serves as a tourist market and at night it tuns back to the small community's sleeping quarters. You can explore the rickety wooden structures along meandering wooden walkways and platforms where you will even find a floating soccer field. 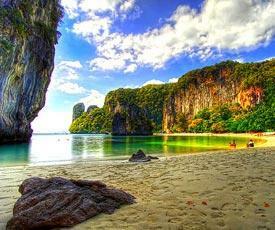 Koh Hong island is a very popular attraction in the bay. It only has one beach of sparkling white sand and offers brightly colored marine fish and coral for snorkelers. Hong is the word for room and in this case used to describe cave systems found in the interior of the islands which is only accessible by canoe. In the middle of the island the most stunning caves are located and at high tide you can paddle into the caves and swim in pools of crystal clear water.